Identifying Cultured Pearls isn't easy.. Strands of undeclared imitation pearls are flooding the marketplace. Approximately 2.5 million strands of pearl imitations, enter the market each year, including 20 mm faux pearls, fake black pearls and faux graduated pearls. Just how many of those 2.5 million "pearl- buyers" were aware that the "cultured" pearls they bought were pearl imitations, is anyone's guess. What Is An Imitation Pearl Anyway? The pearl imitation business can trace its beginning back to the 17th century. Parisian bead maker, Jaquin, is believed to be the first person to invent the faux pearl technique. Early pearl imitations involved coating the inside of blown glass spheres with a mixture of ground fish scales and varnish, then filling them with wax. Paris remained the major producer of these types of pearls until the 19th century. Art Deco Jewelry may include cultured pearls because it was around the Art Deco era that Mikimoto pearls first hit the market. Although you may find your jewelry retailer has the best intentions, many jewelers and antique dealers are not qualified in identifying pearls. It pay dividends to read up on the subject of Cultured pearls first yourself. On the other hand, if you are certain your pearls are Genuine Cultured Pearls, you may like to ascertain their Quality to determine the value of the pearls. 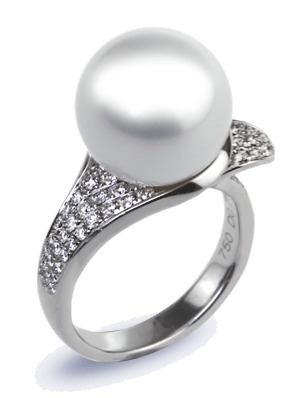 The Quality of pearls is established through a grading process. Click here for information on grading cultured pearls. If you're in any kind of doubt about identifying cultured Pearls, a good piece of advice is to "follow-the-drill-hole" manifesto. Drill holes can tell you a great deal. The pearl imitation will look rougher around the edges of the bead at the drill hole. There will be no nacre layer next to the bead, and the really tacky fakes are easy to identify as they look like a reamed out bead of plastic around the drill while Akoya Cultured pearls will appear clean and smooth around the drill hole; it's good idea to do the drill hole inspection in daylight. Other tell-tales signs will appear as unevenness and rough formations due to the lack of finish applied to the manufactured pearl. Imitation Pearls may also look like painted beads. If there is no drill hole through the pearl on your Antique Pearl Brooch for you to examine, one of the best ways of identifying cultured pearls in this case is to "bite" your pearls. This old testing method is called, the "tooth-test"! Run the pearls gently across the surface of your teeth. Glass and plastic will feel smooth across the enamel on your teeth. The faux strands will feel like nail polish feels on your nail when you rub it against the bottom edge of your tooth. Cultured pearls on the other hand will have a very fine gritty feel to the tooth. Identifying Freshwater pearls (which are not fakes) from cultured pearls, on the other hand, is much more difficult because freshwater pearls are non-nucleated (which means they are not cultured in the same way as cultured pearls like the Akoya) and to further complicate the process of identifying freshwater cultured pearls, the Chinese have more-or-less perfected the art of freshwater pearl farming.